No scarring or fasteners visible. Only (1) EB-TY and one (1) screw are required at joist and deckboard intersection. All work is done from top side. Spacing of deck boards is automatically set at 3/32". EB-TY's are essentially invisible from top or bottom of the deck.The dark color blends with the shadow line of the joints. EB-TY system is economical, labor saving and attractive. Sets all deck boards to a level and uniform height.Relieves the stress caused by natural shrinkage of the deck boards. 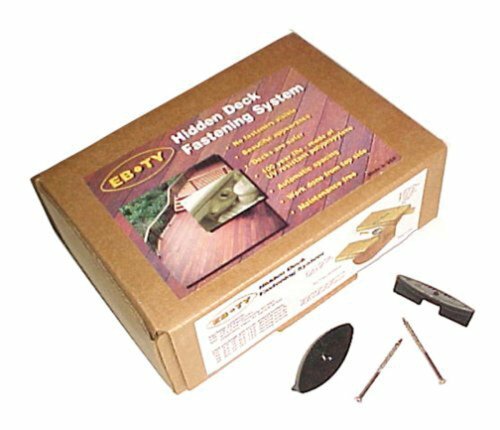 EB-TY system was designed for use with all decking materials. Decks are safer with EB-TY (no nail pops! ), maintenance free. EB-TY is formed out of UV resistant polypropylene which has a 100 year life.